Make two taps from one! Make two taps out of one with individual on/off valves. Fits all standard ¾ inch BSP taps. This two-way Brass Manifold Y-connector will screw directly to your existing BSP tap and allows you to make two taps from one! Fitting any standard 3/4in BSP tap, the two outlets allow you to do more - just think, use two timers on the same tap or to fill watering cans and buckets while never having to remove your garden hose! Each outlet has an easy-to-use on/off valve which makes them really simple to use and gives you two uses from one tap. 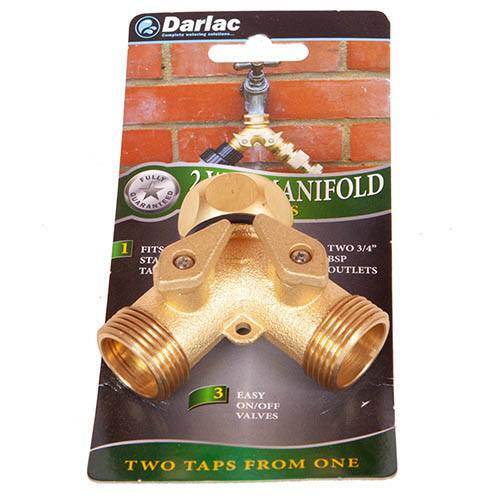 A 2-Way Brass manifold to fit directly onto any standard 3/4in BSP tap.